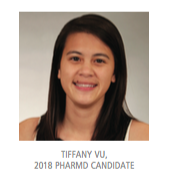 Tiffany Vu, a 2018 pharmd candidate at the Campbell University College of Pharmacy & Health Sciences, sees her future pharmacy work as an opportunity to live out her passion to serve others. Although Vu grew up with several pharmacists in her family, she was reluctant to follow in their footsteps and initially set her sights on a career in business. Her aspirations shifted during her freshman year of college, however, when she embarked on a mission trip to Nicaragua. There, after witnessing the lack of adequate health care for Nicaraguan communities, Vu felt compelled to pursue a career that would enable her to help individuals in need. While at pharmacy school, Vu demonstrated her commitment to service through a number of philanthropic endeavors. She considers her most rewarding experience to be her involvement with the Campbell University Community Care Clinic (CUCCC), a free, student-run health clinic. Vu served as its student pharmacy director, a position that enabled her to lead fellow pharmacy students in assisting underserved patients in their community while putting their knowledge and talents to practice. “Through the CUCCC, we are able to provide medications free of charge for our patients and help them with patient-assistance programs,” Vu explained. “I think that knowing that you can actually help people without expecting anything in return is one of the best feelings in the world.” Vu has also traveled with a group of her peers to Honduras, where they provided health services to patients in the city of Choluteca, and has spent several weekends volunteering at a Remote Area Medical clinic in Bristol, Tennessee. “My true calling is to serve, and I try my best to find diverse volunteer opportunities that allow me to impact various communities locally, domestically, and abroad,” Vu said. Q: What do you think is the most important quality for a pharmacist to possess? A: Without a doubt, empathy. It is the gateway to better patient care. Without empathy, it is hard for patients to open up and express themselves, to ultimately trust you as a professional. No matter the setting you work in, most of the people you meet are sick and rely on your knowledge and expertise to get better. When we meet patients, we tend to only get a snapshot into their lives. I think it’s extremely important to take a step back and try our best to put ourselves in their shoes. Although it may be time-consuming in a fast-paced profession, taking the time to show that you understand and genuinely care about their well-being can ultimately help patients overcome a mental hurdle they may face on their path to recovery. Q: Is there a specific patient or person you’ve worked with who taught you something that will help you be a better pharmacist? A: It’s hard to pinpoint a specific person or patient. I feel like I am a culmination of multiple incredible influences. One person who has helped me through pharmacy school is Dr. Katie Trotta. She has fostered my growth personally and professionally, as she took me under her wing in my first year. She has pushed and challenged me outside of my comfort zones, and without that, I would not be the person I am today. She has taught me so much in the classroom and in the pharmacy, and how to apply my knowledge and skills directly to patients. Q: What do you think is the most important issue in pharmacy today? Why? A: I think it’s integrating pharmacists into interprofessional teams. All of my volunteer experiences revolved around multiple professions working together toward a common goal, which is to provide the best patient-centered care possible. I have seen the synergy between the professions in smaller settings, but I hope that pharmacists will have a greater role in rounding in all hospital settings in the future.